HUGE GIVEAWAY! in celebration of 20 year anniversary, one very lucky winner will receive $5,000 in blu dot designs! AND two other winners will receive $500 in credit to shop anything at blu dot. i have the in my dining room (full reveal of the makeover with designer soon!) and it’s perfect for storing extra dishes and entertaining supplies. we have the in our office too. blu dot is seriously one of my favorite furniture companies, they are so stylish, modern and cool! what would you choose if you won? they have so many great chairs and sofas! to enter click through below and follow the instructions…good luck, everyone! 1) visit the Blu Dot and enter your email to enter! 2) follow the prompts to follow Blu Dot on Instagram for more entries! 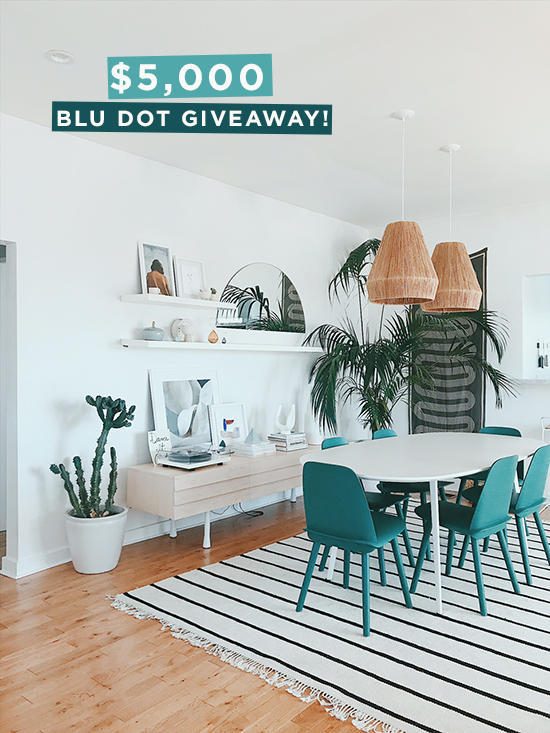 one winner will receive $5,000 in Blu Dot designs and two other winners will receive $500 in Blu Dot designs. credit can be used online at or in any of our US stores. the winner will be chosen on 9.22.17. open to u.s. readers only, sorry! Ooh, my husband was just talking about how we need to replace our sofa. I love Bludot’s Paramount sofa! My fingers are crossed! We just purchased a house and I’d love the Second Best dining table and the Clutch dining chairs to go with it! love the Minimalista Square Coffee Table! I’m eyeing that Sunday Sofa! Love the Free Range Coffee table!! After years of abuse from the cat and moving to new apartments, it’s time to replace my sofa. Loving the New Standard 78″ Sofa in Spitzer Grey! I’ve been looking at the Chicago 8 box book shelving. 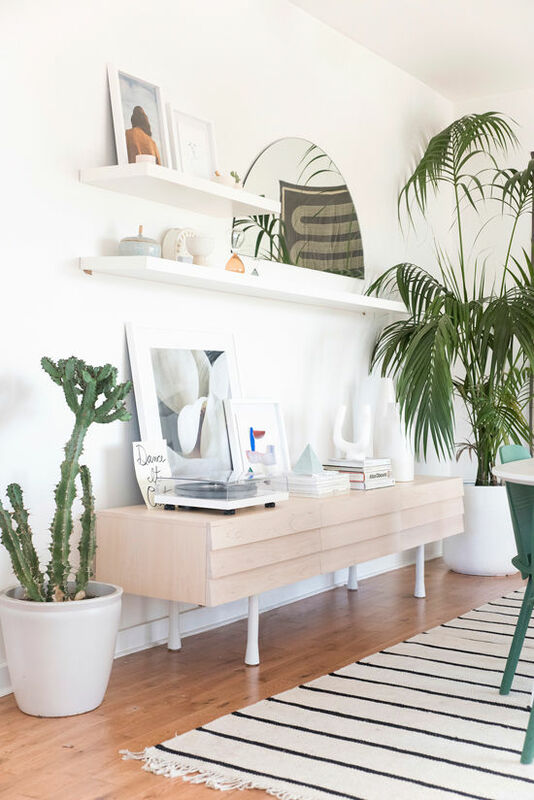 I love that credenza! The mono lounge chair would also be perfect in my office. I’m in dyer need of a new sofa, my kids have killed ours and it’s falling apart, I love the standard 92″ sofa! I LOVE the Shale 4 Drawer credenza and the Paramount sofa with the left arm chaise. So great! I love the Nook bed! It’s so cozy, but also architectural! We would definitely find a sofa for our living room. Ours is in tatters! I’m in need of a desk revamp. I’m loving the clutch chair and the marble tray! My living room sofa is nearly 15 years old. With two kids and countless movie nights it has taken a beating. I’m eyeing the New Standard Sectional Sofa. I also love the Swole large table and the Splash coat rack! Loving the Lap Nightstand, the Laika Pendant Lights, and Bonnie and Clyde Sectional Sofas. So cute, I’m already obsessed! Definitely in the market for a new sofa. Our current one is way too small for 2 humans and 2 cats! I have just the right place for the last chance mirror!! I love the Dang Media Stand, both for its name and it’s cool design! I love the 3 Door Credenza and the Nightstand. The Field lounge chair would be the perfect addition to my home office. The copper real good Bars tools are MY FAVORITE THING EVER. Oh my gosh, those modern chairs are perfection! 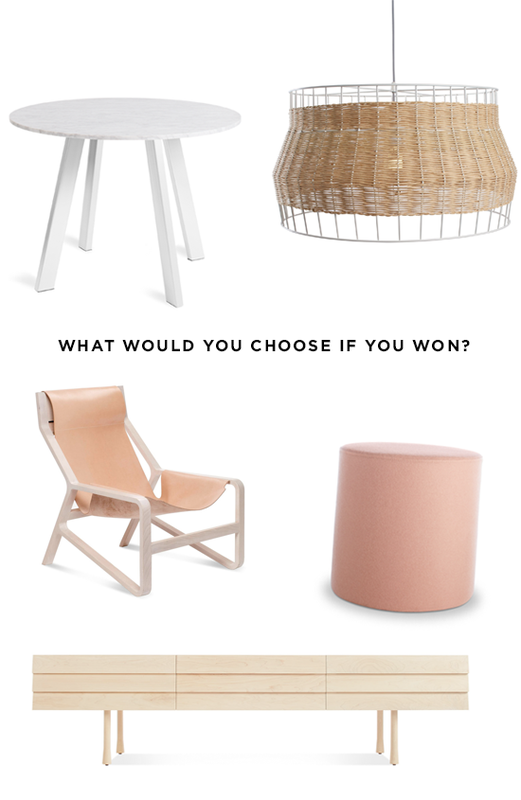 Ive been eyeing this chair for a while now, and would love to win it!! Thank you for this awesome giveaway, blu dot is the best! I love the Paramount Left Sectional Sofa. I am getting married in November and it’d be a great start to our new home! My life would be made complete with one of Blu Dot’s sectionals. Okay, I’m exaggerating but they are stylish and would solve some seating problems in our living. Thanks Blu Dot! Even the standard sofa is great! Field lounge chair in navy! Love the linen duvet covers!!! I’d freshen up my bedroom with a Hush Full Bed in navy and throw any (or all) of those cute duck duck pillows on top. LOVE. I desperately need a new sofa so this would be perfect! I love the Field Lounge Chai, especially in the craig red! Gorgeous! I really like the Toro Lounge Chair! I’ve been on the hunt for a good rug, and I absolutely love the Charlie rug. need that Clad 6 drawer dresser!! Loving the white oak bookshelves! I would definitely get a set of lounge chairs with ottomans for my front porch! The toro lounge chair in day is gorgeous! I love the Sunday sofa! Love the free range coffee table and a new dining table!!! I would also love new outdoor furniture, great stuff. I totally heart the Dandy Leather Sofa which would look so great with the Field Lounge Chair & one of those adorable Mima Pillows! We just spend all our money on a new house in Portland, OR and have nothing left to spend on cute furniture! Please help us to outfit our dream karaoke room!!! I’ve had my eye on the toro lounge chair forEVER! I need the Bub Table Lamp on my bedside table! My boyfriend is moving in next month – love these Sunday Sectional couches for tv&cuddling! I like the field chair in Edwards tomato. Have been wanting a sleeper sofa so my parents can visit and not have to sleep on an air mattress for ages! Diplomat Sleeper Sofa please! It is the perfect lovely solution! so in love with this dresser! I am a big fan of the Field Lounge Chair! Thank you for introducing us to this site. I just moved from a studio apartment to my very own home, so we are in need of furniture! Our big backyard needs a little personality so I would probably choose multiple items from your outdoor furniture section! Perfect for entertaining. I would love that coat rack, the last one I had fell apart. :'( But there are so many things I’d love for my apartment! A new sofa for sure! Looks like everyone is looking for a new sofa. we are redoing out upstairs to make it a master bedroom with a reading nook and i want to have two REALLY great and comfy chairs up there! i LOVE the momo chairs! Crossing my fingers and toes! I manage a music venue and we deserpately need to revamp our green room. ah! we just moved into a new house and need to furnish it so this would be amazing!!! all of their lighting is so gorgeous- and is it weird i want the Hecks ottomans in every single color?!? Love your entire living room! Fingers crossed for this one! love love the swole large coffee table! I just moved across country to California and had to start over with my home furnishing. I would love some bedroom essentials like the 6 Peek Drawer Dresser! The White Oak totally appeals to my Beach Chic aesthetic! I love the sofas and linen duvets! I love the Dandy Leather Studio Sofa but honestly everything on the site is super cute! Thanks for sharing! so many great things! i love the new standard sofa. i’ve been eyeing the sunday sofa and the toro lounge chair for years. if i could furnish my whole house in bludot, i would!! Just bought our first family home in Eagle Rock which is TINY so definitely need some new furniture that will better fit the space! Love the duck duck pillows and nook bed! A chic sleeper sofa, maybe the Diplomat. Love the nook beds! So cozy! i loooove the nook beds and the big squishy arless sofas! I love the toro lounge chairs. Fell in love with them at Olive and June and now want one for movie nights! I would love love love a new sofa! oh that beautiful toro lounge chair i’ve been eyeing… please please please!